Late summer. Very long blooming. Very easy. Short lived but a happy self-sower. Masses of small blooms. Food for birds and buterflies. 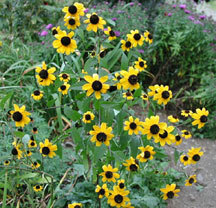 Nan's favorite Rudbeckia.